Following the experience of the website www.marketsofrome.com, this tour proposal aims at offering tourists and visitors the unique opportunity of getting to know Rome in some of its authentic corners. After the experience gained through the site now you can take a real ‘tour’ following the suggestions of and coming with us for a tour and tasting in some of the most interesting and traditional markets in town. Chiara Ugolini, journalist, mother and fourth generation of a farmers’ and greengrocers’ family, has come up with some tour proposals, which can be customized according to customers’ interests: a playful tour for families with children, a tour through regional and local specialties for food lovers and many others. 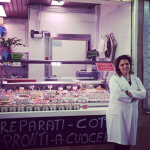 Chiara will introduce you the market of Piazza dell’Unità located near Ale & Niki’s Home. Built on the commercial side of Cola di Rienzo road, the covered market on Unità square in Prati neighborhood was built in 1928, in neo-classical style with a monumental portal opening on Via Cola di Rienzo and turrets at the corners of the building. The tour starts from the market coffee shop where you will hear about the market history and its role in the Vatican neighborhood while enjoying a cup of coffee or a cappuccino. The first stop is at Cesarina’s, one of the few farmers still remaining, who will tell us about her 5o years’ experience at the stall. Next the gourmet fishmonger Fish & Chic and the butchery Il boss della carne (literally, the meat boss). At the end of the tour, each guest will receive a short guide, Just around a corner, with some useful suggestions of things to see in the market’s neighborhood, which will help you discover a less common Rome. A food and wine tasting is included, which can be adapted to meet any specific need.